I've selected five single buybacks to showcase one a day over the course of five days in celebration of reaching 1,000 total buybacks in my franken-set project. 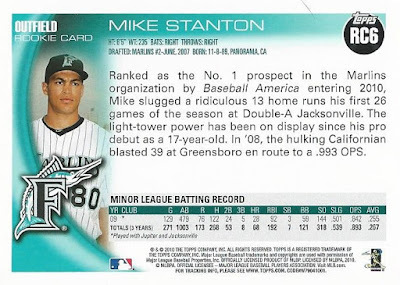 Today I've got my 997th buyback, featuring The Bronx's newest slugger, Mike Giancarlo Stanton! Yankees fans are excited to see what kind of damange Stanton can do in 2018 (while Red Sox fans like myself are dreading it! ), and it's easy to understand why. His absolute monster 2017 season resulted in 59 home runs, 132 RBI and an OPS of 1.007 en route to an All-Star selection, Silver Slugger Award, and a National League MVP Award. It was fun watching Giancarlo smash taters last season. Kinda reminded me of being a fan in the late '90s, waking up each morning and checking to see if he went deep. Only with (hopefully) less "juice". At the very least it was the only reason from my point of view to watch Marlins highlights each day. In the end, Stanton came the closest anyone not named Bonds, McGwire or Sosa ever has to topping Roger Maris' record of 61 home runs in a season. 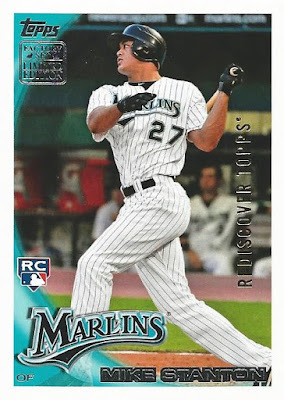 It's unlikely, but can you imagine the hysteria (and the number of Topps NOW cards!) if he threatens that hallowed number 61 again this year, but wearing a Yankees uniform? 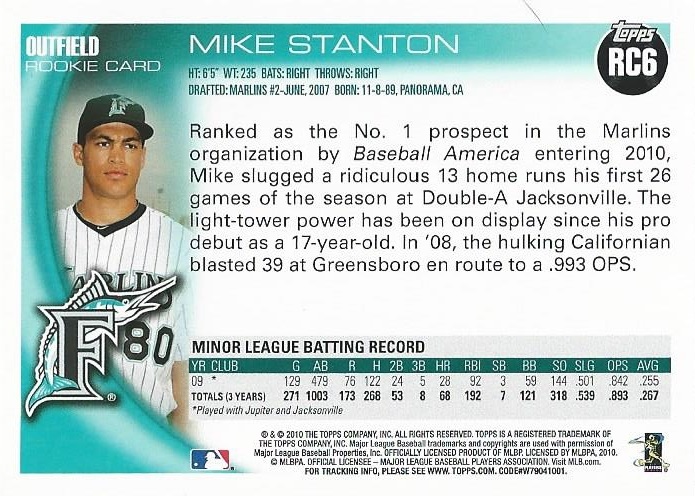 ...this is actually a rarer version that was included as part of a 10-card insert set that was available only by purchasing a 2010 Topps factory set from Wal-Mart (around the holidays I think). 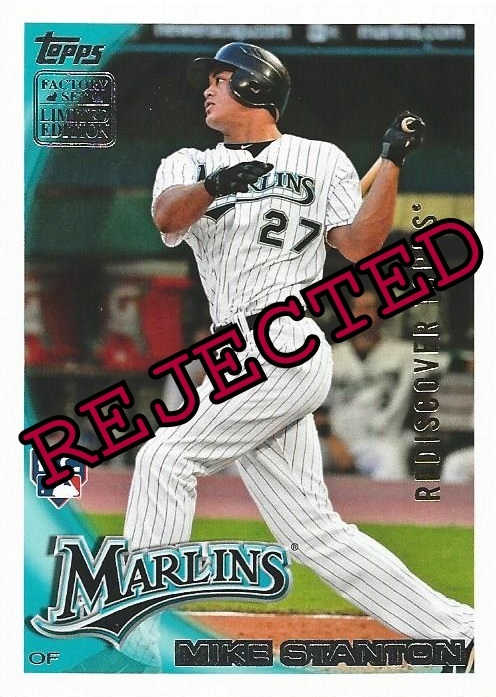 The cheapest "non-buyback" copy of this card on COMC is going for north of $30, significantly more than his standard Topps rookie from 2010 Update. 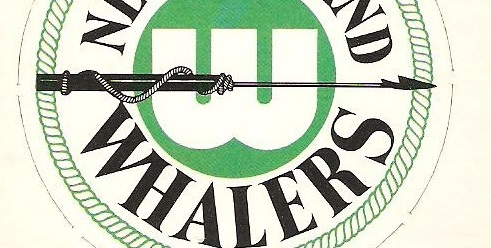 A buyback version like this? I'm not aware of another copy that's available anywhere right now. Pretty cool card. Unfortunately, due to its odd numbering as an insert (RC6), this one's ineligible for the franken-set binder based on my strict rules. Sure, I could've just put it in slot 6 of the binder and that would've been great, especially since that's the only number I'm lacking to finally complete the first page. My OCD just can't overlook that leading 'RC' though, and I really want the franken-set to be composed entirely of buybacks from Topps' flagship proper. It's unfortunate that Stanton had to be disqualified based on a technicality, but I still love this buyback! Easily the king of the reject box for now! That's saying something too, as there are now over 450 cards sitting in there. Check back tomorrow as the countdown continues. We'll go backwards in time a few decades and feature another guy who won an MVP, this time on the AL side! Whoa, you are bringing out the big guns now! Where did you find such a unique buyback? Hah, right! Nabbed this one last August on COMC for $10.50, I think it'd only been up for a matter of hours when I found it! The majority of the buybacks I've acquired since starting on this have come from one of three places 1. COMC 2. eBay (typically lots) 3. generous collectors/bloggers that send them to me! Aww! Mike, I mean Giancarlo, was robbed! Seriously though, a great card on it's own merits. Barring injury the Giancarlo and the Judge show should make for a fun summer in the Bronx. Even though I don't look for buybacks of modern cards for my frankenset, I still can't help but admire just how great this one is!